TOPIC: Re:Using capos to avoid retuning the basses. I've been playing my alto for a solid 8 months now, and just had my first solo concert performance along with various excellent 7-string guitarists. I'll be finishing up post-production on the video soon, and will post a link here when I'm done. In the process of learning and performing several pieces as a soloist, as well as with my trio, I've discovered that I dislike having to retune the basses. I decided last week that I'd had enough. I looked into harp levers-- too bulky and expensive. I considered "railroad spikes" like banjo players use-- too destructive. I even considered having my 8th string extension removed like James did. But... sometimes I want an open C#. Then, in a semi-delerious state of prolonged internet browsing, I discovered my solution: the "Spider Capo". The ukulele/banjo 4-string size fits perfectly on the fretboard extension of my alto and lets me capo one string without affecting the others. That goes on the 8th string, which I can now toggle between C and C# in less than 1 second. 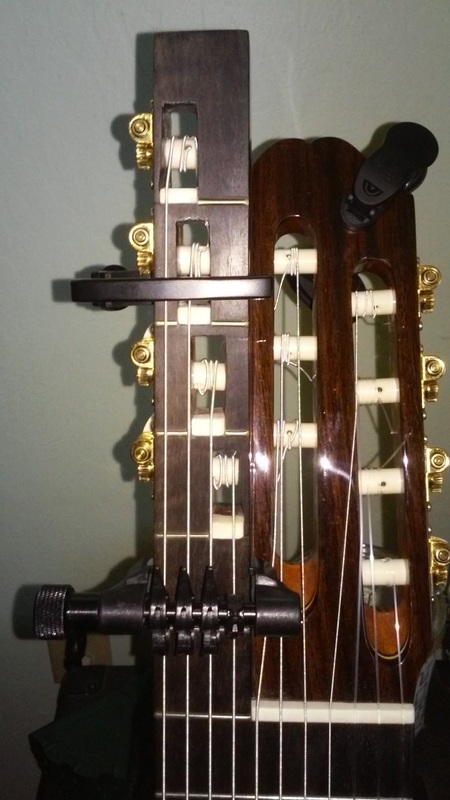 Some players might "Spider Capo" the other 3 basses, but so far all I've needed are the one on the 8th string and then a normal capo on the 11th string. I can now play in D and A without re-tuning. If I raise my 7th string to D#, I can do E major as well. Or, with the B string tuned down half a step, I can capo that up to B and quickly go to the key of F or Bb when needed. Without re-tuning or using a capo, the alto really only plays in C or G (assuming you are using the extended basses). With my two capos (one spider and one planet waves NS classical), I can now play in Bb, F, C, G, D, A, and E, all with a maximum of one string re-tuned. With a couple more Spider capos, you could also get the keys of B, F#, Eb, or Ab. Not bad. This is a lifesaver in concert situations where you are playing pieces in multiple keys back to back. Your audience will thank you. Guitar concerts already have enough tuning! It seems a great idea but could you post an image so that we can get a better idea of how it works? Here's a shot of it. In this setup, I'm using them for the key of E Major (concert pitch G). I've only retuned the 7th string up a half step and the capos are doing the rest. Incidentally, here is the link to that concert I mentioned. Alto guitar stuff starts at 26:10 and 1:23:00. There is some really good seven-string guitar playing in it as well. The effect of fatiguing the string by repeated retuning does not occur. The tension of the string does not increase by raising the tone of the open string relatively to the base tuning of the string, so there is no impact on the tension exerted on the bridge. Last Edit: 2018/07/01 15:37 By silvanig. Exactly! The tension on the strings is more consistent, and the overall stability of the instrument is improved compared to retuning more strings. It's the little things in life that feel the best.